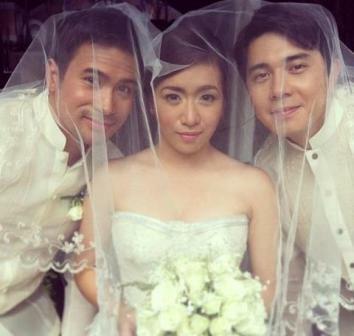 A wedding picture of Angeline Quinto, Paulo Avelino, and Sam Milby?! Hmmm...who do you think between the two hunks will Aurora (Angeline) choose?! Will it be Adam (Sam) or Lance (Paulo)? Now that Paulo’s character in ABS-CBN’s kilig-serye “Kahit Konting Pagtingin” has finally won the heart of Aurora, Lance is ready to take the next step and marry the woman of his dreams. Is Adam already too late to fight for the only woman he has ever loved? Is he ready to confess to Lance that he also loves Aurora? In the end, who will Aurora choose between the two brothers—is it going to be Lance who has proven his love for her, or will it be Adam, who has always kept his feelings for her?